This book and its companion, Volume II, concentrate on new procedures--especially those based on the new molecular methodology--developed within the past decade. This volume outlines the approaches, techniques, and procedures applied to cell and molecular biology studies of mycoplasmas. 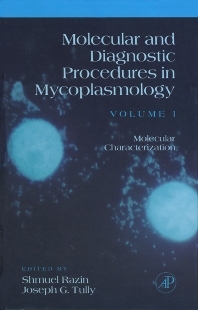 Volume II deals with the new genetic and immunological tools applied to the diagnosis of mycoplasma infections of humans, animals, plants, insects, and all cultures, with particular emphasis on the association of mycoplasmas with the activation of AIDS. Microbiologists, virologists, molecular biologists, cell biologists, clinicians, and plant pathologists. S. Razin, Molecular Properties of Mollicutes: A Synopsis. J.G. Tully, Culture Medium Formulation for Primary Isolation and Maintenance of Mollicutes. K.J. Hackett and R.F. Whitcomb, Cultivation of Spiroplasmas in Undefined and Defined Media. K.J. Hackett and D.E. Lynn, Insect Cell Culture Approaches in Cultivating Spiroplasmas. J.A. Robertson and G.W. Stemke, Measurement of Mollicutes Growth by ATP-Dependent Luminometry. D.Taylor-Robinson, Intracellular Location of Mycoplasmas. D.J. Wear and S.-C. Lo, Localization of Mycloplasmas in Tissues. D.C. Krause and M.K. Stevens, Localization of Antigens on Mycoplasma Cell Surface and Tip Structures. B.C. Kirkpatrick, N.A. Harrison, I.-M. Lee, H. Neimark, and B.B. Sears, Isolation of Mycoplasma-Like Organism DNA from Plant and InsectHosts. H. Neimark and P. Carle, Mollicute Chromosome Size Determination and Characterization of Chromosomes from Uncultured Mollicutes. T. Proft and R. Herrmann, Physical and Genetic Mapping. K. Dybvig, Characterization of Virus Genomesand Extrachromosomal Elements. J. Renaudin and J.-M. Bove, Plasmid and Viral Vectors for Gene Cloning and Expression in Sprioplasma citri. K. Dybvig, G.E. Gasparich, and K.W. King, Artificial Transformation of Mollicutes via Polyethylene Glycol- and Electroporation-Mediated Methods. A. Razin and P. Renbaum, DNA Methylation Analysis. B. Bhugra and K. Dybvig, Identification and Characterization of Genome Rearrangements. P. Renbaum and A. Razin, Expression of Mycoplasmal Genesin E. Coli. A. Wieslander, S. Nystrom, and A. Dahlqvist, Posttranslational Modification of Membrane Proteins. K.S. Wise, M.F. Kim, and R. Watson-McKown, Variant Membrane Proteins. S. Rottem and M. Tarshis, Membrane Fusion. U. Schummer and H.G. Schiefer, Mycoplasma Membrane Potentials. S. Rottem, Ion Flow and Cell Volume. J.D. Pollack, Methods for Testing Metabolic Activities in Mollicutes. R.J. Miles, Rapid Microcalorimetric and Eletroanalytical Measurements of Metabolic Activities. C.C. Dascher and J. Maniloff, Characterization of Heat Shock Proteins. F.C. Minion and K.J. Jarvill-Taylor, Nucleolytic Activities of Mycoplasmas. T. Watanabe and K.-I. Shibata, Proteolytic Activities. S. Rottem and M. Salman, Phospholipase Activity in Mycoplasmas. J.G. Tully and R.F. Whitcomb, Minimal Standards for Description of New Species of Class Mollicutes. W.G. Weisburg, Ribosomal RNA Sequencing and Construction of Mycoplasma Phylogenies. S. Razin and D. Yogev, Restriction Endonuclease Analysis. D. Yogev and S. Razin, Southern Blot Analysis and Ribotyping. B. Schneider, E. Seemueller, C.D. Smart, and B.C. Kirkpatrick, Phylogenetic Classification of Plant Pathogenic Mycoplasma-like Organisms or Phytoplasmas. J.G. Tully, Determination of Cholesterol and Polyoxyethylene Sorbitan Growth Requirements of Mollicutes. I. Kahane and E. Jacobs, Mycoplasma Adherence to Host Cells: Methods of Quantifying Adherence. E. Jacobs, Mycoplasma Adherence to Host Cells: Epitope Mapping of Adhesins. I. Kahane, Oxidative Damage Induced by Mycoplasmas. R. Gallily, A. Avron, G. Jahns-Streubel, and P.F. Muhlradt, Activation of Macrophages and Monocytes by Mycoplasmas. B.C. Cole and C.L. Atkin, Indentification, Characterization, and Purification of Mycoplasmal Superantigens. Y. Naot, Mycoplasmal B-Cell Mitogens. P.M. Stuart and J.G. Woodward, Modulation of Expression of Major HistocompatibilityComplex Molecules by Mycoplasmas. W.C. Lai and M. Bennett, Interaction of Mycoplasmas with Natural Killer Cells. Subject Index. Frederick Cancer Research Center, Frederick, Maryland, U.S.A.